On November 8, 1904 Harvey Hubbell Jr. patented the first electrical plug, an invention that changed the industry forever. The receptacle was like the base of an Edison base light bulb. so in 1928 Philip Labre invented the 3 prong plug with a safety ground. Harvey Hubbell III took his father's invention a step further, and in 1938 introduced the first Twist Lock plugs. 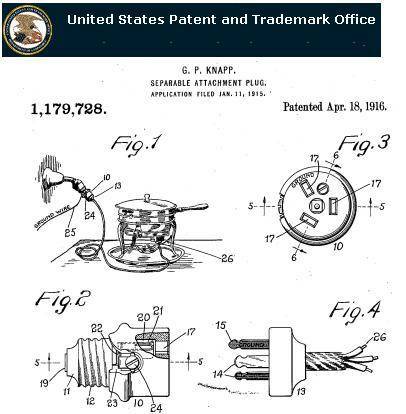 Hubbell had previously patented the first pull chain light socket in 1896. Happy Birthday to the start of something shocking! Lets plug in some birthday candles. There's this 3 prong plug invention in 1915, the one that looks like the one used in Australia today. Last edited by wa2ise; 11/11/13 09:02 PM. Thanks to both Electure and wa2ise, for posting these items!!! Ditto on the "Thank You" guys. Interesting stuff. Invented 99 years ago and we're still trying to get rid of them. Reason I say that, guys, is because every now and then, I'll go to a house over here, where a guy has one of the Bayonet Cap versions of these adaptors, in his garage and he's got it wired up to a 2 bar (2000W) heater and wonders WHY he keeps blowing lighting fuses. This sort of thing was banned over here back in 1976, but some people have still not heard that news-flash. I wonder what the intended use for that 3-prong plug was! It can't really have been earthing if there was an Edison adaptor. Maybe it was designed for two hots, e.g. from a 3-way Edison socket. Edison to socket adaptors were banned in Germany rather early, actually in 1959 (along with plug-in multi adaptors for Schuko plugs as they were considered dangerous for the mechanical integrity of the socket). Don't know when they were banned in Austria, but probably not much later. Last time I've seen one in use was back in the 90s and they were rare by then. Just noticed that it would be the 109th anniversary, 1904 to 2013 is 109 years. Ten years ago it was the 99th.